A corridor vision plan that establishes a framework to link New Albany's learning campus and village center while protecting and activating a natural asset. The Rose Run stream has formed the physical, visual, and emotional heart of the community throughout both its early history and during the more recent changes in the Village. Initially serving as the southern border to the commercial district, the Rose Run stream has emerged as the defining linkage between the different components of the Village core. MKSK was hired to study the existing conditions and plan improvements that would maximize this community asset. 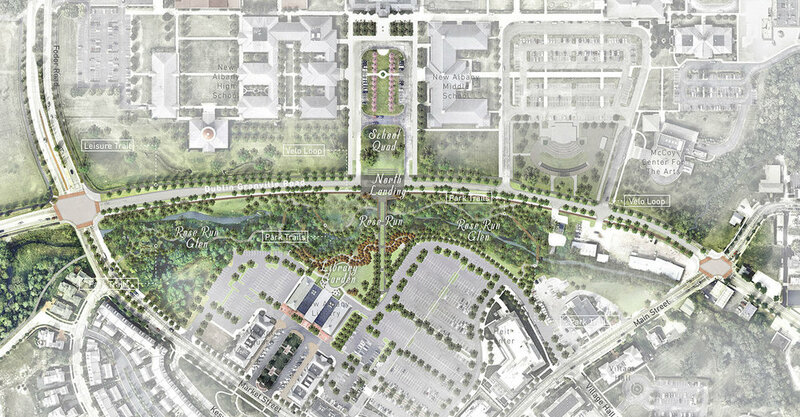 The plan will intertwine the riparian edge of the Rose Run stream corridor with more urbanized pedestrian connections and green space, bringing together previously divided land uses. The goals are to add a half-mile to the local bike network, improve the natural quality of the stream corridor, bridge the community, create community event space, and provide outdoor space for library activities. Planned improvements begin with the realignment of Village Hall Road to reclaim park space between the Library and the Rose Run corridor. Acquirement of this land facilitates the new Library Gardens to the south which connects to the new pedestrian bridge crossing the stream. The pedestrian bridge leads to a new plaza overlook along Dublin Granville Road at the southern end of the existing Learning Campus entry greenspace. Both the pedestrian bridge and the plaza overlook will serve as a ceremonial gateway to the City of New Albany. Additionally, this new space will be a focal point of the project and programmed to accommodate City festivals, farmers markets, and other public gatherings. MKSK provided study plan services for the initial design and is continuing design services for the next phase of implementation.